Master Bedroom in my Organic B&B, Amherst, MA features bamboo and organic bedding, lamp shades made by local artist and Leslie Impressionistic Nature Photography for your pleasure and inspiration. Attached to private bathroom, this eco-friendly, green, meditative, healthy, peaceful room is ideal for a 1-2 people. Nestled in the woods in the passive solar home of The Organic Gourmet Chef, Leslie Cerier. Room also has 4 of Leslie’s impressionistic Nature Photographs for your inspiration. House stays cool during summer. Organic Farm to Table Breakfast offered. Additional gourmet farm to table organic vegetarian, vegan, gluten-free seasonal meals and Private and group cooking classes offered for extra fees. No pets or cigarette smokers. Bathrooms are stocked with Organic and natural soaps and shampoos. I enjoyed every moment… from the cozy atmosphere of your home to the wonderful smell of your food ! Everything was simply delicious! And to make it even better I had the opportunity to meet you! Thank you for being a wonderful host! I had an amazing experience at your B&B! My best wishes to you and your B&B! Leslie‘s property is beautiful, and just as expected from her description and photos. I stayed in a large bedroom on the second floor with a very comfortable bed and en suite private bathroom. Every window had a scenic view of the trees and/or her stunning flower garden. Leslie is a very welcoming and friendly host. She’s also an excellent cook! She made me a delicious breakfast with fresh, organic local ingredients (including just-picked raspberries! ), for an additional fee. I was looking for a weekend escape from the city. Leslie’s house in the woods (off a dirt road) was the perfect retreat! I definitely recommend it! I stayed at Leslie Cerier’s Organic B&B with a friend during one of the cooking workshop weekends. The experience was absolutely wonderful. She is such a warm and welcoming host. We enjoyed her beautiful house, every detail is so well thought through. We both think that Leslie should be on TV teaching others how to use green living concepts in your every day life. From her delicious food, to mattresses and pillows to her luscious garden, everything created an atmosphere of relaxation, happiness and joy. I highly recommend Leslie’s Organic B&B! Leslie was a wonderful hostess. Beautiful home and gardens. Spotless accommodations. She made me a delicious breakfast of all organic fruits and locally sourced yogurt for a small extra fee. All in all a great experience. I hope to stay with you again in the future. Setting, the woods, was extraordinarily beautiful, peaceful and quiet. House was lovely. Leslie was very nice, extremely accommodating and flexible. We arrived hours early but that was no problem for her. Gave us an additional room for our daughter in response to our last minute request. Leslie went out of her way to accommodate us. This home was both aesthetically lovely and beautifully functional. The setting was pristine, uncluttered, clean, and spiritually uplifting. We were communicated with well prior to our arrival and we were given a complete and friendly overview upon our arrival. The room was beyond our expectations with Leslie’s beautiful art work tastefully adorning the walls and literally infusing the room with life and serenity. The bed was the most comfortable we had ever slept in. We were very tired upon arrival and after an initial friendly orientation we were provided privacy and quiet so we could wind down and settle in early. For an additional fee Leslie had cheerfully agreed to cook us a wholesome, sumptuous breakfast. Because we are on a tight budget, I had initially thought the cost was a bit pricey for a breakfast, but when I later learned that she is not typically a morning person and yet had been willing to accommodate us and after having enjoyed a lovely breakfast in a beautifully serene outdoor setting, we were glad we had splurged. She is a great cook but if we stay there at a future point and want her to cook, we will opt for a meal later in the day! If you need a natural, contemplative, quiet setting that can really serve as a retreat, this is the place! This was our first Air BNB experience and what a treat! Make sure you request Leslie’s precise directions to the house. Our overnight stay at Leslie’s beautiful home was just fine. The house, and owner, exude warmth. The bedroom is large and airy, and features a very comfortable bed. The equally substantial bathroom suite, offers the choice of bath or shower. The house is spotlessly clean. Leslie’s commitment to an organic lifestyle sets a tone of intention throughout the property. The setting is wonderfully wooded, peaceful and serene. If you’re looking for a true respite from the toils of urban life while visiting the Pioneer Valley, this is the place for you. Leslie’s Organic B&B is a handcrafted home, filled with nature based stunning art, a most comfortable bed, incredible trails through the woods and windows that drink in the beauty. Her warmth and welcoming ways added to our enjoyment. Leslie’s place was perfect for us for a weekend getting way. She was very accommodating of our last minute booking. 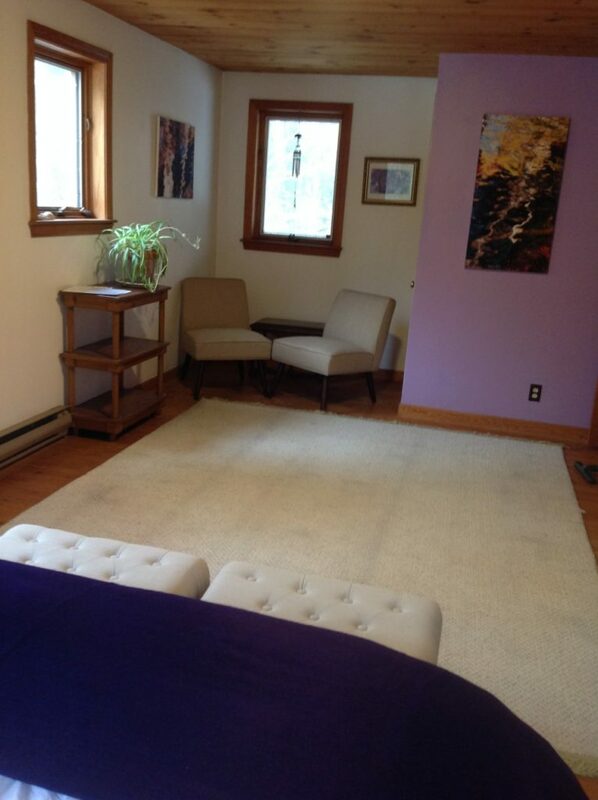 Her place is cozy and in a gorgeous spot- perfect for hiking nearby trails or tooling around Amherst- which has bookstores, great restaurants and an independent movie theater. Next time hope to sample her cooking. By the way, her nature photos hung throughout the home are beautiful. Great stay. Just as described. Beautiful wooded area. And Leslie made a wonderful vegan breakfast. Highly recommended! We had a lovely night at Leslie’s She has created the perfect Oasis!!! Something Leslie said the night we stayed over has really struck a cord. I have vowed to live life more deliciously each day. What a beautiful place! I loved the location (set in the woods) and the simplicity and grace of the furnishings. Leslie was very warm and easy to communicate with – which was good because we didn’t get to her place until fairly late (about 10 pm). The room is clean and uncluttered, and the bathroom is spacious with plenty of room to put your toiletries. Highly recommended! Great place to stay if visiting in Ahmerst area. Leslie was accommodating and on point with directions and places to go. Would definitely stay here again. Wish I had reason to stay longer. Everything was wonderful, top notch. Leslie is such a great host! She’s welcoming and very informative. I would definitely stay with her again if we visit Amherst again. Lovely home and great breakfast!